Once upon a time, a handsome young knave from the mountains of the north was visiting a tropical southern peninsula. Wandering through the streets of a small hamlet, he chanced upon a faire. Citizens from far and wide had gathered for food and song and dance. An army of minstrels was entertaining the crowd with their songs and tales. Our knave paused to purchase a strange sausage from a vendor, for it was, after all, the dawn of a hot, dog-like kind of day. Suddenly, he heard behind him the haunting sound of an ancient instrument known as a Hammered Dulcimer played by a beautiful young maiden. The knave knew at once, this woman would be his partner in music and in life. And so it came to pass. And they were dubbed Dulcinea after Don Quixote’s love by Mistress Debbie of Jamieson for the sweet sound of their instruments and married by Michael of Clan Campbell. And the knave and maiden have come to be known as Dulcinea's Music. And, so, they ply their skills as instructors and traveling musicians and printers throughout the realm. Performance and Instruction: Dulcinea's Music performs its unique interpretation of many styles of music in a wide variety of venues. We play at parties and events of all kinds, dances, stage performances. We go to music festivals from Arkansas to New England, from Michigan to the Appalachians, and of course, all over Florida, our home base. 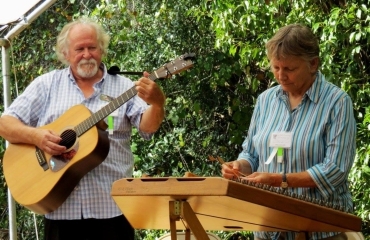 Besides performing and teaching at festivals, we do private instruction in the Southwestern Florida area primarily in hammered and Appalachian dulcimer, as well as guitar, mandolin and banjo. Printing and Design: Dulcinea’s Music is equipped to offer custom design work for bands, groups or you personally. We also produce custom tee shirts, name tags, instrument bag tags and a wide variety of other custom items. 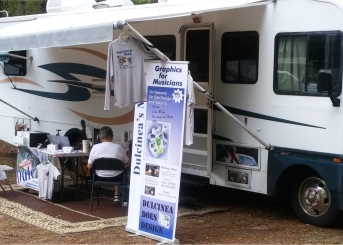 ON SITE Printing and Design: Dulcinea’s Music travels in our motorhome with instruments and equipment for musical instruction and performance as well as custom design and printing. We can set up our print operation at our RV or in your vendor area to produce festival products and custom items for your participants.